CoCo Green Grow Cubes provides an ideal solution for roots..
made for use in green houses . Coir blocks ensure high oxygen levels and therefore good drainage properties. We would like to introduce ourselves as one of the pioneering and leading manufactures as well as exporters of all coir based products and pasteurized organic compost.CoCo Green is a limited liability company started operation since 1992 and has grown from modest beginnings to be an exporter of its products all over the globe..
Environmental protection has never been more important in the world, which is being promoted by all the governing bodies throughout the world. In an era like this, use of natural products in cultivation has gained a huge interest all over the world. As a country well known for coconut based products, Sri Lanka is upto the task by manufacturing coconut Coir Fibre Pith (Coco Peat -CFP) based products for cultivation of various kinds of crops. We assure you the best quality and the best service at all times, maintaining the "Highest international Quality Standards". 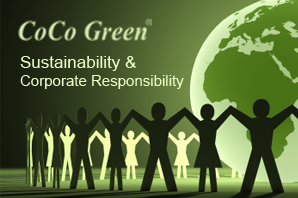 A strong commitment to society and the environment has been inherent in the CoCo Green (Pvt) Ltd throughout its existence.